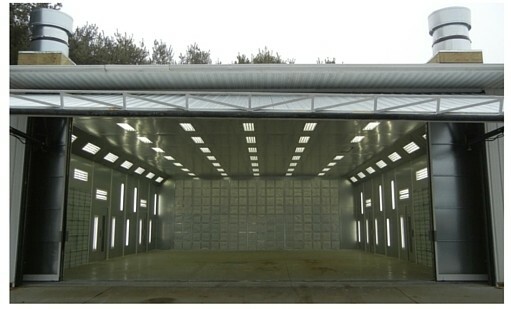 This Industrial Paint Booth Oven shown below was manufactured for a large farm equipment company. 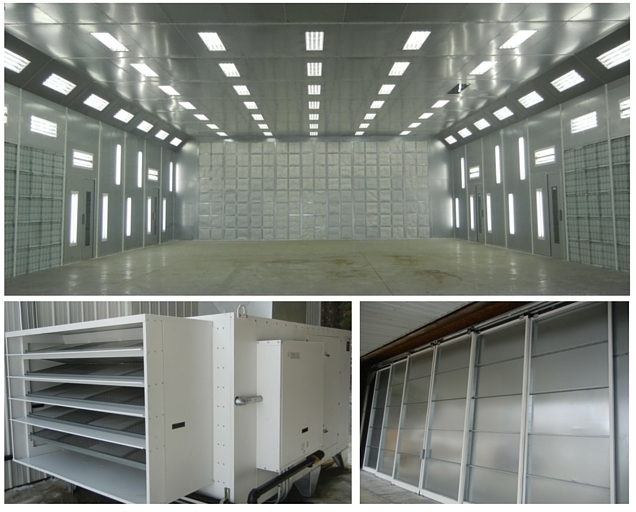 This is one of our recent cross flow large equipment spray booth installations in Michigan, US. The dimensions of this cross flow spray booth oven are 38’W x 14’H x 54’D. It also contains a 30’W x 13’6”H leaf articulating the main door with exterior mounted intake & exhaust plenums for a maximum interior work area. The exhaust fans are controlled by a variable frequency drive for booth pressure balance and approximately 80 tube light fixtures make this booth an awesome workplace. A 50,000 CFM, 4.75 Million BTU heated air movement system manages the airflow in the booth. The body of the booth is constructed from 18 guage, G-90 galvanized steel for years of corrosion free service.